Roof Pitch Calculator – Learn to Measure and Calculate Roof Pitch. This easy to use roofing pitch calculator will help you estimate roof pitch / angle, convert roof pitch to degrees, roof size in squares (100 square feet), length of your gables / rafters, as well as amount of roofing materials needed to install your roof. Roof Pitch Calculator 1.0 – To calculate your roof pitch and roof size, measure your roof and plug in your measurements in accordance with the diagram on the right. Free Roofing Estimate – Roofing Contractors in Your Area – Get up to 4 quotes. All you need to calculate the roof pitch, is your roof’s footprint or your house ground dimensions (length and width), and the rise of your roof from it’s base (length of a median / bisect). This roof pitch calculator is based on the basic principles of geometry, and greatly simplifies the process of calculating roof size, my doing the complicated math for you. First, you will need to measure your roof size from the ground: using a measuring tape, measure the ground dimensions of your home, from corner to corner. If your roof has overhangs, add their width to the ground dimensions – otherwise your roof are might be off by as much as few hundred square feet. Once you have measured your roof, you will need to plug in your roof’s dimensions, where “width” is the gable side, which we will use to calculate the roof pitch and the roof size. Read our roof pitch guide to learn how you can measure the roof pitch off the ground (without climbing the ladder) as well as on the roof, using the level and tape measure. In the fields “Rise” or “Roof Pitch” plug in ether number (whichever you derived from using our roof pitch guide). If you use the roof rise, you can measure it on the gable side of your roof, off the ladder with a measuring tape by going from the ridge of your roof, to the virtual horizontal line which is the base of the roof. Click the “calculate roof pitch” button and you will see the results, showing your roof pitch, angle, as well as roof size. First of all, this roof pitch calculator is limited to estimating roof area for rectangular shaped roofs only. If your home has an “L” or other shapes, the roof sizes will be off. In this case, we recommend you check out our roof measuring guide (will be posted soon). 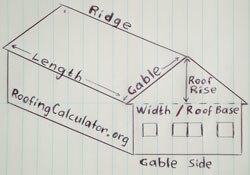 The calculator also calculates roof sizes for Gable Roof only. Other roof types will be added later. The roof installation price for your size and pitch roof, is calculated at about $320 per square, and includes roof tear-off of 1 layer of shingles, and installation of new 30 years architectural asphalt shingles with Ice and Water and 30 pound felt underlayment. This price is averaged out and may not be the going rate in your state. Subscribe to comments with RSS or TrackBack to 'Roof Pitch Calculator'. For this to be truly useful, there should also be an input box for wall height instead of just assuming 8 feet. according to what job they did. Flat roofing has assumed more importance than ever. Please let us know what you think about our Roof Pitch prices calculator and how we can improve it. If there is a mistake or you want us to add something to the calculator, please submit your feedback in the comment box below.